Donald is committed to community involvement, having served on the Board of Trustees at the University of South Carolina (USC) and most recently founding The College Transition Connection, Inc., a non-profit ... See More organization whose mission is to help South Carolina colleges create post-secondary programs for young adults who may have an intellectual disability. Donald's son is on the autism spectrum. 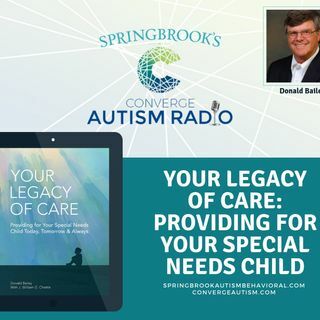 He is one of the authors of Your Legacy of Care: Providing for Your Special Needs Child Today, Tomorrow & Always and a speaker at the Converge Autism Summits that are held annually by Springbrook Autism Behavioral Health in South Carolina. For this podcast he joins counselor, Melanie Vann, to discuss his experience as a father of a child with Autism.